Our dedication to proper results, customer satisfaction and reliability are just one of the things that have made so many people happy, be one of them and call 0151 673 0104 to get a quick quote or book instantaneously your upholstery cleaning from professional upholstery cleaning company. 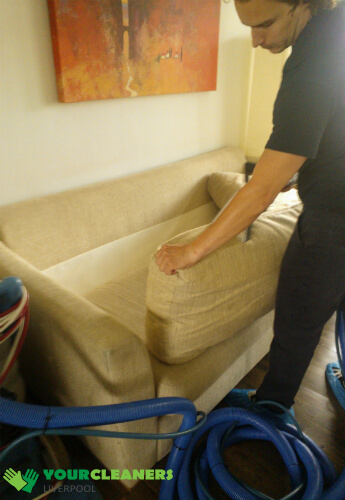 The upholstery cleaners made an effort to cover the furniture cleaning treatment of a wide range of upholstery materials such as Velvet, cotton, silk, suede, natural and synthetic leather, kashmir, wool, vinyl, acrylic and a lot more. Natural leather tends to lose some of its flexibility with time and use, this is due to dryness which can, in later stages, lead to tearing and flaking. To prevent or remedy early stages of dryness, Liverpool upholstery cleaner uses a moisturizing agent made of natural ingredients that integrate well with the leather. Depending on the thickness of the material we apply several times using a microfiber cloth until the pores of the leather are open and start absorbing the moisturizing agent. Using this can also help with stain and dirt removal and other aspects of leather maintenance. There is a quick drying period so the leather can better absorb the agent. This upholstery cleaning treatment works wonders with fibrous synthetic and woolen upholsteries, removing dirt and grime from them. The moisture used in the cleaning process helps for dust and allergen particles to clump up and be extracted using our vacuum machines, it reduces air pollution and makes the upholstery a lot more pleasant to the touch. The upholstery cleaner will use a natural detergent and the steam jet to remove stains from the surface and base of the fibers. The heat disintegrates it, allowing for full fiber cleansing. We remove everything using a vacuum, and along with all of the debris in the fiber, we also extract 95% of the moisture used in the cleaning. Ask for steam cleaning on an affordable cleaning prices. Q: Can you fix the discolorations from my upholstery? A: While we've had great success with dirt discolorations, we cannot guarantee absolutely spotless results with old stains and discolorations on your upholstery. Q: How long will my couch dry for after the upholstery cleaning? A: Anywhere between 3-4 hours, a lot quicker with our air movers for faster upholstery drying. Q: Are your upholstery cleaning detergents safe for child and pets? A: We use high-grade upholstery cleaning bio-degradable detergents which once applied have a short half-life, breaking down to basic compounds which we extract along with the filth. 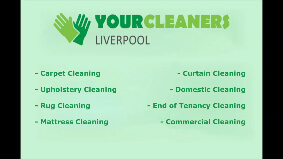 To book treatments with upholstery cleaners in Liverpool, get answers to any company or cleaning related questions or to receive a free quote, call 0151 673 0104 or use the online booking form located on our website.